I was wondering, I have family dotted around Palmerston North and the Chorus UFB map shows they should all be getting their fibre-capability by June 2015. My question is; is there a way to get a firmer date? For instance an address is "planned" for a certain date. I would expect Chorus to have a more detailed roll-out timetable so interested to find out for these addresses. Not really going to HOLD them to the date, but more around getting ready for a particular month and not renewing long-term contracts with current Telco providers. Anyone who knows or has been given the information by an ISP or Chorus for your own address, your insight/experience would be greatly appreciated. Have you tried using the Pin tool on the Chorus Fibre Rollout map? That gives a firmer expected date for specific addresses on the map. Yip, just gives a response of Fibre by June 2015. As the areas covered within the shaded area are all "by June 2015" I'm interested in when a particular address/street is planned for. Out of a given area defined by "June 2015" that address could be either next week or 31 May 2015. So would be looking at finding out that the 'actual' month is. jonb: Have you tried using the Pin tool on the Chorus Fibre Rollout map? That gives a firmer expected date for specific addresses on the map. if it says June 2015, then they have a contract to finish it by then and penalties if they dont. Mine had May 2014 on the map for at least a year and May 31 it went live, even though they started Nov 2013. It's probably nearer to June 2015 for those addresses then. Other addresses around Palmerston North, like around Hokowhitu, say Nov 2014 or Jan 2015. My address had UFB between june 2014 and July 2015, now it says, UFB by 2016. My street is hilly and bendy and is due to have UFB installed by the end of November. Work doesn't appear to have started yet (although it may have down the other end of the street - it's a one-way street so I don't get down the other end much). I'm guessing that work will begin in your street in Nov/Dec-ish. Fibre went into our street in Feb 2014. It still isn't live. The date said June 2015. I see now mine has changed to July 2014. Be glad that your address doesn't show on the Chorus map as "UFB deployment dates for your area are still being developed"
astrae: Fibre went into our street in Feb 2014. It still isn't live. The date said June 2015. I see now mine has changed to July 2014. Check with your ISP, it might already be available but the Chorus map hasn't been updated. My address was available for fibre with ISP at least a couple of weeks before Chorus map changed to dark blue. You should count yourself lucky, almost the entire southwest side of Palmerston north is unplanned according to the chorus map. My household is on one of the lucky sections in that area to have a date of June 2016.
charsleysa: You should count yourself lucky, almost the entire southwest side of Palmerston north is unplanned according to the chorus map. My household is on one of the lucky sections in that area to have a date of June 2016. I spend most of my working day provisioning fibre for customers in Palmerston North and Wanganui mostly and yet I live in the West End, Palmerston North "We'll get back to you when we have finished Auckland region" area. I would be truly grateful for a date at all. Lucky! 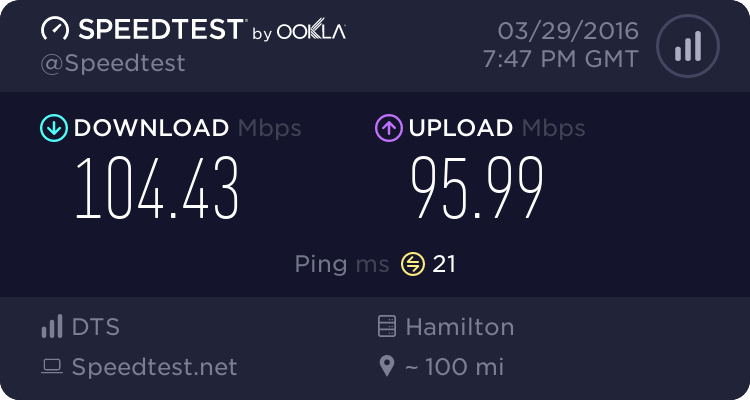 I only get 33Mbps /10Mbps! I want my 1Gbps for my lolz, because 100Mbps would do for pretty much everything else.